Thankyou to everyone who took the time to come up with a suggestion for the dome. I agree with Sarah that the dome creates separation and anything in it will feel special. Jane's idea of painting the dome black to give the impression that the moths are flying out of darkness has a lovely Gothic feel, that's if Gothic and lovely really go together. 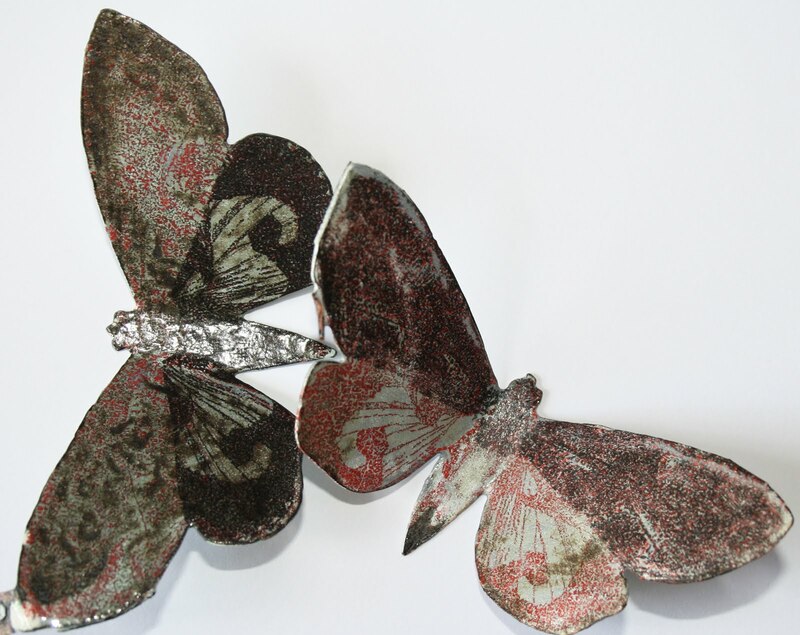 Sharon's idea for a contrasting, brightly coloured moth works, as does Wendy's moth predator. Narrative will play a large part in what I want to make next. Other ideas have been suggested to me, a carriage clock although I think that person watches too much Antiques Road Show. A stuffed bird, a dead bird with it's legs in the air. Cruel and not what I would really do, but a fluttering trapped moth has appeal, if I was technically adept a projection of a flying moth would be very clever. You have all got me thinking and trust me a bare light bulb has not been ruled out as I had already bought a bulb with a curly filament from Baileys last year when I started making the moths. But Lesley's alternative light source using reflective surfaces or glow worms has set me off in a different direction. As you can see I made 2 moths and drew out 2 names from the up turned dome just after 8pm, so congratulations Wendy and Lesley the moths will be winging their way to you later in the week. What a great set of responses and well done to the winners! Beautiful moths and lucky recipients!